An ESPN The Magazine collaboration. Within 10 minutes of meeting Ndamukong Suh, one thing was perfectly clear to me: We don’t know Ndamukong Suh. But when we hear his name — consciously, or subconsciously — we weave an idea of a complete person around just a few data points. “I think you’d have to get to know me to be able to understand it, and having the opportunity to be around me from a day-to-day perspective would shed light on that. No interview’s gonna be able to do justice to that,” he said … while I interviewed him. My first thought — “then why the f— am I here?” — aside, I knew he was right. We don’t truly know any of our athletes. We only know what they show of themselves. And so in many cases, what we get is some variation of a trope that we have deemed acceptable. I came to LA prepared to squeeze Suh into one of those tropes. I had planned to introduce the world to the new Suh. The more mature Suh. The Suh who, this offseason, chose to play in a 3-4 defensive scheme where he would be asked to play nose tackle from a 0-technique, despite having only played 3-technique in 4-3s since college — clearly now acting for good of team, not self. The contrast of those two positions was the perfect symbol for the new Suh I thought I saw. A 0-nose takes on double teams, allowing others to make plays. A 3-tech penetrates, gets tackles for loss, and is violently destructive. For many years Suh was the perfect 3-tech, and he became known more for crossing the line of violence than destruction of offenses. And with that came a reputation as a dirty player. Los Angeles Rams defensive tackle Ndamukong Suh at the Rams’ practice facility in Thousand Oaks, California. So, while I would be surprised if Suh crossed the line this season, maybe I shouldn’t be. Apparently, if it was in him then, it might still be now. But it’s worth noting that Suh has had just one personal foul or roughing the passer penalty this season — despite the leaguewide uptick. Maybe that’s because he’s under less pressure on a star-studded Rams team. Or he’s gotten better at harnessing whatever impulse that makes him a force during plays and made him notorious between plays. But I feel less equipped to predict Suh’s future now than I did before we talked. For most of the interview, he was guarded. No matter how delicately or firmly I probed, he didn’t care to expose himself. The moments where he offered a fleeting glimpse at who he is came when we discussed game strategy, or his current and former teammates. Suh, who is known as a bright guy, was stimulated by the nuances of his position. When I asked how it felt to play with so many great teammates in LA, he seemed offended on behalf of his former rostermates, listing accomplishments and accolades of teammates in Miami and Detroit. 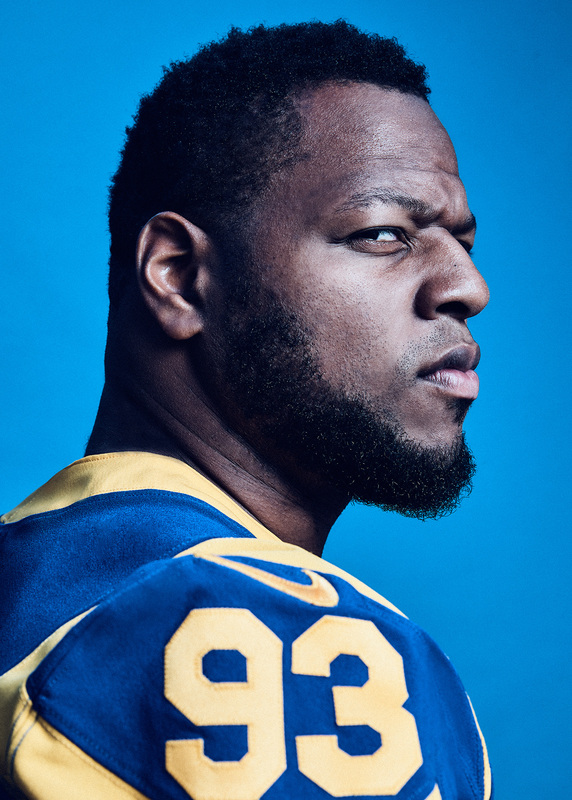 I went to LA with the aim of presenting a manicured snapshot of Suh to the sports world. That idea didn’t appeal to him — at least not through the lens of a 20-minute interview. But I look forward to the point where he allows all of us to get to know him and present a truer image of who he is. Even in my brief time, I walked away with so much more than the one-dimensional, outdated image most sports fans have of Ndamukong Suh. 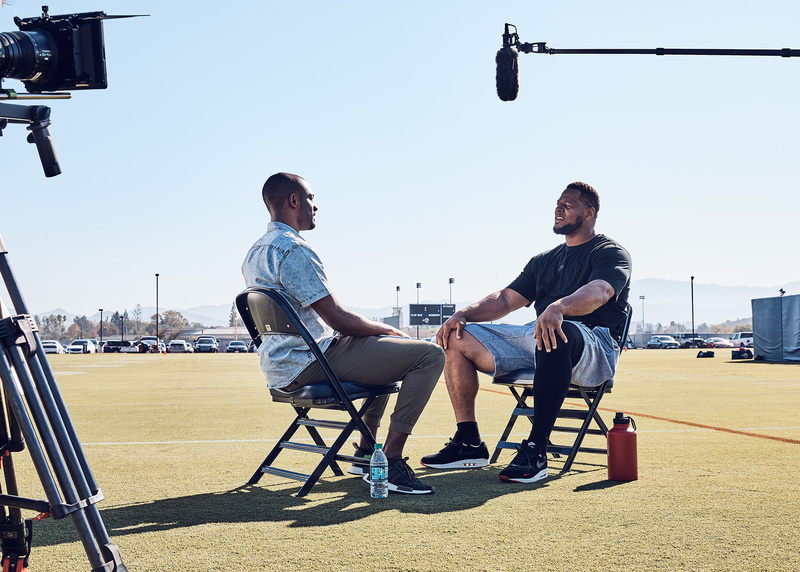 Los Angeles Rams defensive tackle Ndamukong Suh (right) is interviewed by The Undefeated’s Domonique Foxworth at the Rams’ practice facility in Thousand Oaks, California. Domonique Foxworth: Your whole career you’ve played a 4-3 defensive tackle, but in LA you’re playing a 3-4 nose. Were you at all concerned about that transition? Ndamukong Suh: I looked at it as a new challenge. I always felt there’s not much of a difference between a 4-3 system and a 3-4 system — it’s just how many different guys are coming at one particular time. I’ve watched a lot of your play, back to college. At 4-3, you would penetrate, destroy, disrupt. In the 3-4, in the Denver game in October, there were a couple of times where you ate up three players. You took on the double-team on a pass play, the rest of the rushers got one-on-ones, then you fell off and tackled the checkdown. Yeah. There’s opportunities. You’ve gotta know where they’re gonna be. You’re gonna have double-teams. You’re gonna have two to four hands on you at all times. Being in the nose position, being tight, you just find ways to be creative and get to the ball. That’s the most important thing. I’ve played nose, three-technique, five-technique. Passing situations, you may have me at end, at a nine, whatever it may be. There’s a variety of opportunities afforded to me, and that’s all I can ask for. At this 3-4 nose spot, you’re eating up blocks. You’re not necessarily looking to make the tackle on every single play. That’s something we have to look at in understanding these defenses and the different ways you play. Defensive linemen sometimes gotta be dancing here or taking the double-teams. I think Aaron [Donald] feels that — people respect him. They’re gonna have slide protection to him. Being at the end, I may get your protection with a full slide and a back and a tight end coming to block me, and I have to win those situations. The great thing about our defense is that at any point, whoever’s given the opportunity to win a battle, they can win. The other two of the three guys gotta bite that bullet and take it for the team. How rewarding is it for you to free up other guys? I’m sure Aaron’s getting a lot less attention than he’s used to. Everyone on the defense gets opportunities in large part because you’re doing your job. How rewarding is that? I think it’s always been that way. No matter where I’ve been, whether it’s been in Detroit or Miami, being able to see Cam Wake in Miami get eight, 10 sacks a year ever since I was there and then being able to see Aaron get four sacks in a game. People see that you may not get the individual stats, but it’s a collective thing — you get those stats together. There’s no way any D-lineman can get those things without his linemates getting pressure on that quarterback. You’ve added some things to your game because you are in a 3-4 now. Has that changed your mindset? No, I wouldn’t say my mindset’s any different than what it was when I was a rookie or a third- or fourth-year guy. Even the last couple of years. I still wanna be dominant, still want to be competitive and still have ways of doing that and showing that. How would you explain the state? Everything I’ve read about you and everybody I’ve talked to about you say it’s like a switch. You are mild-mannered, obviously very nice and thoughtful guy off the field, and then I think a lot of athletes say that they’re different on the field. I think you’ve got to understand each and every person’s different personality. The way somebody carries himself on the football field and outside of the football field might not be the same. I look at it no different than being able to walk into a business room or a board meeting and being able to speak their particular language. What about your upbringing has allowed you to be the player and the person that you are on and off the field? I’ve got two amazing parents, both from Third World countries, that brought me up in one of the best ways. Very humble, hardworking and go out there and get what you want. Nobody else is gonna give it to you. That’s always been my motto and my focus. Also, give thanks to people that have helped you along the way. Do you think that immigrant mindset is something that they’ve passed on to you, and you draw some of the intensity that you have in the game from that same tenacity that you have to show when you land in a new country and make a success of yourself? Being able to learn, being able to adjust and adapt is the biggest thing I’ve learned from them. Being from Third World countries, things weren’t given to them. They’ve gotta go out there and teach themselves, and so I’ve always prided myself on not being afraid to learn from others, on going and teaching myself different things and being well-educated. Who was the person who kind of sold you on coming to LA? Was there anyone? I wouldn’t say anybody “sold” me. I saw an opportunity, and was obviously was relieved of my duties in Miami. I took the opportunity to reflect on the situation there and look forward, knowing that I can add value. As I mentioned before, it’s one of the things I pride myself on. I wanted to go back to the old-school way, as you’re going to make a decision to go to college, and take visits. Be able to look people in their eyes and see what they’re really talking about, and I think I made the best decision. When you visited here, what was it that made you feel this was the right place? Just the culture and the understanding of how they looked at things, as well as having a backbone in [strength and conditioning coach] Ted Rath, somebody who’s been with me seven out of my nine years in the league. He’s an integral piece. A lot of people don’t know this, but your strength coach is one of the hearts of your team. In my opinion, after the head coach, that’s one of the most important positions. After nine years in the NFL, how would you say you’re a different person or a different player? Obviously wiser. Experience is always one of the best tools anybody can have, which then goes into learning. Learning the game, understanding the game. Seeing how people want to block against you, the different ways they choose to do things and how the times have changed from when I got into the league of how offenses are run. That experience is key. This story appears in ESPN The Magazine’s November issue. Subscribe today!